100 Penguins Released Into The Wild! MUST WATCH VIDEO! Nearly 100 happy feet waddle back to the ocean in New Zealand as 49 little blue penguins are cleared for release following their oil spill rescue last month. TODAY.com's Dara Brown reports. Adorable Video. Wonderful to see, it must be very rewarding for the rescuers as well. Thanks Lindsey! Great story! Lindsey, you forever bring a smile to my face! Thank you. I was smiling all happy to see these images again until the woman said that they put microchips in them! Why can't they just release the animals back into their home without implanting something in them or putting something on them? And I gave them stupidly extra kudos when I first saw this because I saw no collars! 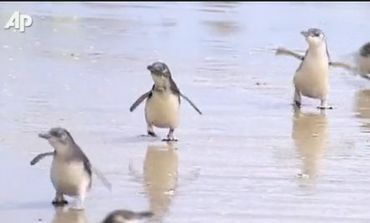 Noted What a great video I like them little happy feet,they looked so happy heading for the water , just wonderful to see..thanks Lindsey! Thanks Lindsey for the great video, They look so cute. Just returned from our local movie theatre play 'Happy Feet Two' so of course I noted and watched the amazing video! Thnx Lindsey oh and btw, 'the king' penguin wore a sweater, too! Thanks Lindsey! I watched this video and a couple more with my son! OMGoodness, Lindsey, thank you so much for the smile! Free at last...YES...I am free at last! The heading should say 49 Penguins Released, as it does in the story... great that they are released, but there needs to be more precautions taken by container ships and other ocean-going vessels, and a moratorium on deep sea oil drilling, so there is no danger of ANY oil spills happening again. YAY!!!!!!! Thanks for the awesome news, Lindsey!!!! Watched earlier & big thanks to all those who helped save these little ones. What a happy sight! Thanks for sharing it, Lindsey! Well look at them go! haha! Very cute. Hooray for the release of the penguins! May the Almighty keep them safe! Good work rescuers down under (well, sort of) great to see some of them released. Great news to be released for the penguins, but I can't say the same for the chip as we will all be next. Control control of all beings. Thanks Lindsey. Noted. Thank you for posting, Lindsey. Thanks so much Lindsey for sharing this wonderful news. Great article. Love it. Thanks for posting. Wonderful to get some good news for a change! They are so adorable! Thank you Lindsey for sharing this!